As per ASF "Apache Kafka is publish-subscribe messaging rethought as a distributed commit log". It is an open-source message broker written in Scala. It provides a unified, high-throughput, low-latency platform for handling real-time data feeds. The design is heavily influenced by transactions logs hence defined as "messaging rethought as a distributed commit log". Kafka was originally developed by Linkedln, open sourced in early 2011 and later was contributed to ASF. Kafka is considered as The Next Generation Distributed Messaging System. In today’s world, real-time information is continuously getting generated by applications (business, social, sensor based positional data etc). This information needs easy ways to be reliably and quickly routed to multiple types of receivers. This leads to a need of efficient message producer/consumer based systems (for growing volume, velocity of data) and to provide an efficient integration point. Message publishing is a mechanism for connecting various applications with the help of messages that are routed between them for example, by a message broker such as Kafka. Kafka is a solution to the real-time problems of any software solution, that is, to deal with real-time volumes of information and route it to multiple consumers quickly. Kafka provides seamless integration between information of producers and consumers without blocking the producers of the information, and without letting producers know who the final consumers are. A Kafka solution may have variety of consumers ranging from real time, NoSQL, Hadoop, warehouses to other producers. Mainly a large amount of data is generated by the companies having web-based presence. These are mainly big internet players. This data can be user-activity events corresponding to logins, page visits, clicks, social networking activities such as likes, sharing, and comments and operational and system metrics etc. Though the need is very much clear but the real-time usage of this heterogeneous large data collected (from production systems) has become a big challenge because of the volume of data collected and processed. It is not easy at all to handle such big volumes and velocity of data flowing in. Apache Kafka is designed to cater needs of offline and online processing by providing an efficient mechanism for parallel load in big data systems as well for real-time consumption over a cluster of machines. It works over connection oriented TCP with a binary protocol. Kafka can be compared with Apache Flume as it is useful for processing activity stream data; but from the architecture perspective, it is closer to traditional messaging systems such as ActiveMQ or RabitMQ. Note that Kafka does not completely comply to JMS or AMQP specifications. Kafka fully supports reliable messaging with out of the box persistent. To derive the real value from big data, any kind of information loss cannot be afforded. Apache Kafka is designed with O(1) disk structures that provide constant time performance even with very large volumes of stored messages, which is in order of TB. Apache Kafka explicitly supports messages partitioning over Kafka servers and distributing consumption over a cluster of consumer machines while maintaining per partition ordering semantics. Messages produced by the producer threads are immediately visible to consumer threads; this feature is critical to event-based systems such as Complex Event Processing(CEP) systems. Kafka guarantees that the messages sent by a producer to a particular topic partition will be appended in the order they are sent. That is, if a message MSG01 is sent by the same producer as a message MSG02, and MSG01 is sent first then MSG01 will have a lower offset than MSG02 and appear earlier in the log. Further a consumer instance sees the messages in the order they are stored in the log. Note that for a topic with replication factor N, Kafka can tolerate up to N-1 server failures without losing any messages committed to the log. 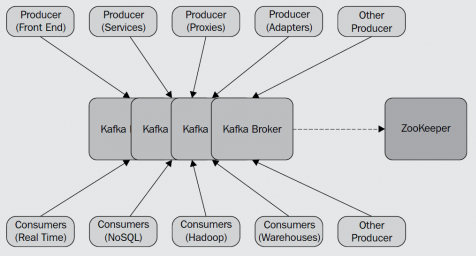 LinkedIn uses Kafka for the streaming of activity data and operational metrics. This data powers various products such as Linkedln news feed and LinkedIn Today in addition to offline analytics systems such as Hadoop. DataSift uses Kafka as a collector for monitoring events and as a tracker of users' consumption of data streams in real time. Twitter uses Kafka as a part of its Storm a stream-processing infrastructure. Kafka powers online-to-online and online-to-offline messaging at Foursquare. It is used to integrate Foursquare monitoring and production systems with Foursquare, Hadoop-based offline infrastructures. Square uses Kafka as a bus to move all system events through Square's various datacenters. This includes metrics, logs, custom events, and so on. On the consumer side, it outputs into Splunk, Graphite or Esper-like real-time alerting. More information about Kafka users is available at Apache Kafka web page. Kafka relies heavily on the filesystem for storing and caching messages. As per the Kafka documentation "there is a general perception that 'disks are slow' which makes people skeptical that a persistent structure can offer competitive performance. In fact disks are both much slower and much faster than people expect depending on how they are used; and a properly designed disk structure can often be as fast as the network." Rather than maintaining as much as possible in-memory and flush it all out to the filesystem when system run out of space, it follows inverted approach. It immediately writes all the data to a persistent log on the filesystem. In Kafka, the state of the consumed messages is maintained at consumer level unlike conventional messaging system where consumed message information is kept at server level. Consumers store their state in ZooKeeper. Kafka does not have any concept of a master and treats all the brokers as peers. This approach facilitates addition and removal of a Kafka broker at any point, as the metadata of brokers are maintained in ZooKeeper and shared with producers and consumers. A message set represents a unit of compression in Kafka. For compressions, messages recursively contain compressed message sets to allow batch compressions. A message set is just a sequence of messages with offset and size information. This format happens to be used both for the on-disk storage on the broker and the on-the-wire format. A message is consumed by a single process (consumer) within the consumer group and if the requirement is single message is to be consumed by multiple consumers, all these consumers need to be kept in different consumer groups. Consumers of topics also register themselves in ZooKeeper, in order to balance the consumption of data and track their offsets in each partition for each broker they consume from. Multiple consumers can form a group to jointly consume a single topic. Each consumer in the same group is given shared group_id. For example if one consumer is your foobar process, which is run across three machines, then we might assign this group of consumers the id "foobar". This group id is provided in the configuration of and is your way to tell the consumer which group it belongs to. The consumers in a group divide up the partitions as fairly as possible, each partition is consumed by exactly consumer in a consumer group.